PATERSON – Change is defined as the act of becoming different and at CUMAC change is in the air. Executive Director, Rev. Pat Bruger, is retiring this summer. At the same time, after eight years as a member of CUMAC’s development team, Stephanie Ames is transitioning into her new role as Development Director. Taking Stephanie’s place is Akeera Weathers, recently hired to lead CUMAC’s volunteer department. The team has also hired a new driver, Joe Elder, who will help CUMAC pick up and distribute food and resources around the Paterson community. With so many changes happening and much more on the way, the CUMAC team is planning ahead and thinking about a future that’s full of possibilities. CUMAC’s staff and Board of Trustees recently engaged in a strategic planning process that resulted in a four-year forward looking plan. The strategic plan will act as a road map to guide the staff as CUMAC continues to grow. CUMAC’s strategic plan consists of four objectives, which include achieving financial stability, developing and beginning implementation of a new facilities plan, strengthening programs to move clients toward self sufficiency, and maintaining highly competent and effective leadership during and beyond the transition from one Executive Director to another. If achieved, each of these objectives will allow CUMAC to better serve the Paterson community and expand the organization’s ability to feed people and change lives. Despite many changes at CUMAC, the organization’s commitment to mission remains steadfast. At present, CUMAC pantries are serving groceries and fresh produce to thousands of people every month. The Community Closet is providing clothing, house wares, and other essential items for victims of disaster. At the same time, CUMAC offers housing to 11 people who were formerly homeless, and job training to a vulnerable, low income population. Over the next four years, these programs will continue to be central to CUMAC’s work. However, the organization is also doubling down on its efforts to serve and that comes with its fair share of challenges. That’s why support is needed more than ever. As it’s often said, many hands make light work. Help CUMAC reach new heights by becoming a volunteer or donor this year. 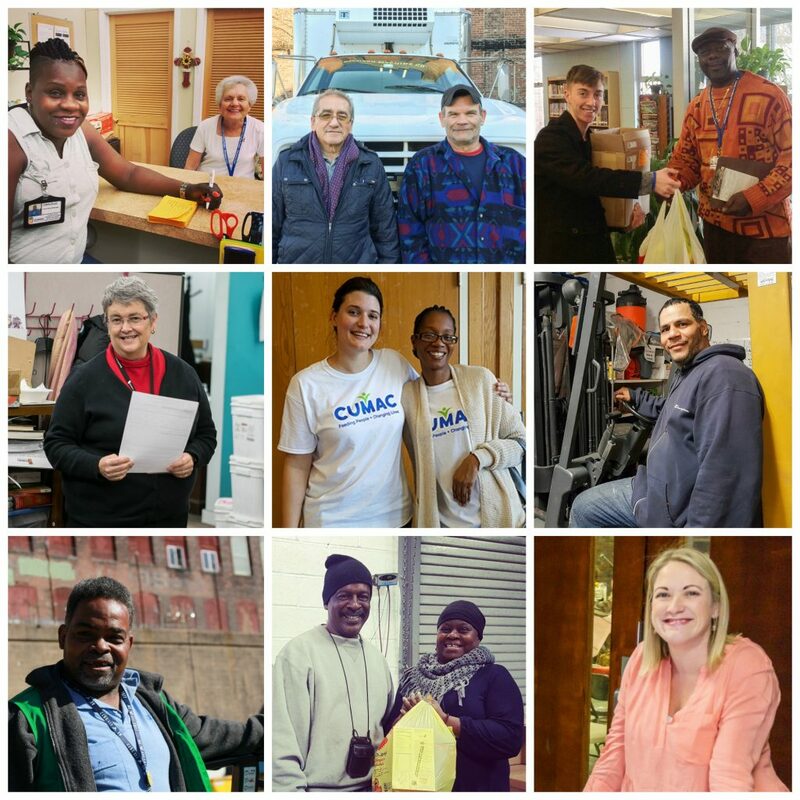 Your commitment will help CUMAC move confidently through transition and will ensure that the ability to provide a lifeline to all of the neighbors in need — now and in the future. After 26 years of feeding people & changing lives, Rev. Pat Bruger will be retiring from her position as CUMAC’s Executive Director. Help celebrate Pat and her incredible life of service at her retirement dinner, being held at The Fiesta in Wood-Ridge, NJ on Thursday, April 27, 2017. It will be a festive evening with a hospitality hour, music, dancing, dinner and some special surprises. We hope to see you there! Can’t make the celebration? You can still honor Rev. Pat Bruger and support CUMAC’s mission by sharing a special message with Pat. Call CUMAC (973-742-5518) or visit www.cumac.org/events for more details.